From its humble beginning four years ago when 65 mountain bikers competed in the first Maah Daah Hey 100, the bike race in the rugged and picturesque North Dakota Badlands has gained worldwide attention. Today, the dream of Watford City’s Nick Ybarra to have a world class biking adventure in western North Dakota has become a reality. 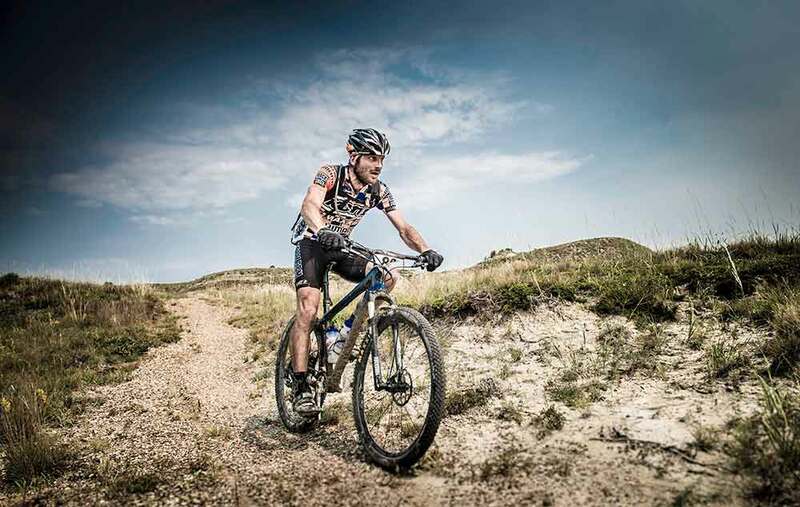 And come Saturday, Aug. 1, over 350 mountain bikers from throughout the United States and Canada will embark upon a 100-mile race that begins at the CCC Campground south of Watford City, and ends in Medora. Several years ago, Nick had met a man in his church in Bismarck, who was taking a 15-passenger van to the Maah Daah Hey trail. That was Nick’s first experience riding the trail and he absolutely fell in love with it. They rode the trail all day, finishing in the dark. Then in 2009, after Nick and his wife, Lindsay, had already moved back to Watford City from Bismarck, Nick decided to ride the entire trail from start to finish. Turning his experience from a personal hobby into a full-fledged event, however, took a lot of hard work and fortitude to get off the ground. That handful of mountain biking volunteers, who along with Nick, started maintaining the trail, ended up putting in somewhere between 600 and 800 man hours in one summer just to keep the trail alive. And that work continues every year. The Maah Daah Hey Trail is one of the longest single track trails in the country, according to Nick. It offers as many descents as it does climbs, and they are never far apart. The earth of the trail is a unique blend of dirt, clay, sandstone, scoria, and whatever else the good Lord mixed into this epic mountain bikers’ playground. It’s world-famous and according to Nick, extremely hard to access. Since the trail cuts through the heart of the rugged Badlands, experiencing the unique challenges of racing it has attracted mountain biking enthusiasts from all over. The Maah Daah Hey 100 has allowed competitive riders to push their limits, while giving every participant an experience they will remember for the rest of their lives. The Badlands provide a truly stunning backdrop for one of North America’s most challenging and rewarding stretches of single track. The Maah Daah Hey 100 is the ‘raddest race in the baddest place,’ says Nick. Just weeks away from race day, riders are getting prepared and hoping their training and racing schedule, leading up to this event, has been both enjoyable and beneficial. Racers have four categories to choose from in the Maah Daah Hey 100, which will take place on Aug. 1 – the 100 Miles – Solo, the 75 Miles – Solo, the 50 Miles – Solo, and the 25 Miles – Solo. The 100 is for professional and expert riders only and will start at 7 a.m. The 75 is for ‘above average’ endurance racers and will start at 8 a.m. The 50 is for ‘average’ to ‘above average’ racers and will start at 9 a.m. And finally, the 25 is for the ‘average’ racer and will start at 10 a.m. The race will start at the CCC Campground, just south past the Long X Bridge, and will end in Medora. There will be about 60 volunteers, including Nick and Lindsay, that will be helping to organize and run the event on Aug. 1. Those volunteers will be spread out between aid stations, checkpoints, and the start and finish lines. Volunteers will be doing everything from being water pourers to bike mechanics to medically trained personnel. Volunteers will also be hiking, biking, and riding horse on the trail to attend to any injured racer. Online registration for the event has closed, but day-of registration may still be available at the venue. For questions about the event, email Nick at nickybarra@gmail.com or visit the website at www.experienceland.org.